A traditional cheese handmade using the milk of Gloucester cows. A rich, rounded, mellow flavour and smooth texture. Made by Jonathan Crump in Gloucestershire, this cheese is special in the fact that is made purely with the milk of Gloucester cattle, one of the rarest breeds of cattle in the country. The cows were developed in Gloucestershire hundreds of years ago purely for dairying and cheese making because the milk has particularly small globules of fat and a high protein content. 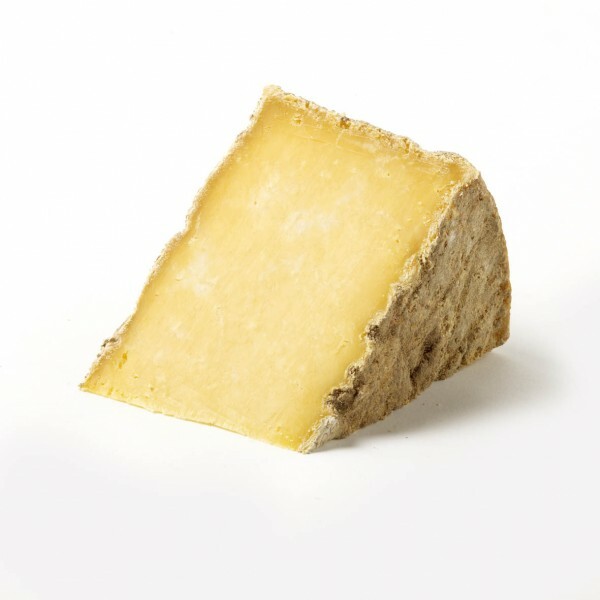 Double Gloucester is a historic cheese, having been known outside the county as far back as the 8th century, and widely acknowledged in Tudor times. However, like many other traditional British cheeses, its recipe and production was nearly lost after ravages of the Second World War. Farmhouse production gave way to anonymous factory production which changed the quality to a cheese scarcely distinguishable from a poor cheddar. Double Gloucester is made with full cream milk, and has an associated cheese, Single Gloucester which is made from skimmed evening milk mixed with whole milk from the morning's milking. When made by hand like Jonathan Crump's Double Gloucester, the golden colour and silky smooth texture make this cheese something very special. the sharp nuttiness of its flavour contrasts well with apples and cider. It is Double Gloucester which is used in the famous Cheese Rolling Ceremony at Coopers Hill in Gloucestershire on Whit Mondays.